Display is 10 digits, Nixie tubes. 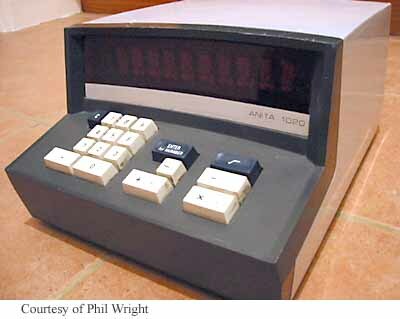 4-function, %, storage, square root, uses RPN (Reverse Polish Notation). Uses a combination of transistors and integrated circuits. 265 x 335 x 172 mm (10.4" x 13.25" x 6.75"). Introduced 1970, price £335 GBP (about US$800). 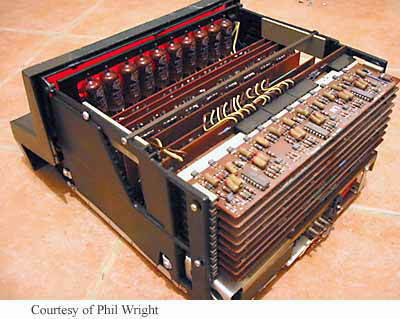 Inside, from the rear, showing a stack of narrow circuit boards at the back, about five larger upright boards in the middle, and the "Nixie" type display tubes. The integrated circuits on the nearest board are in 16-pin packages and so are probably SSI (Small-scale integration) or MSI (Medium-scale integration) devices.